(Newser) – A court in Italy has convicted former Premier Silvio Berlusconi of tax fraud and sentenced him to four years in prison—but the court quickly reduced the sentence to one year as part of a movement to reduce prison overcrowding, the Telegraph reports. 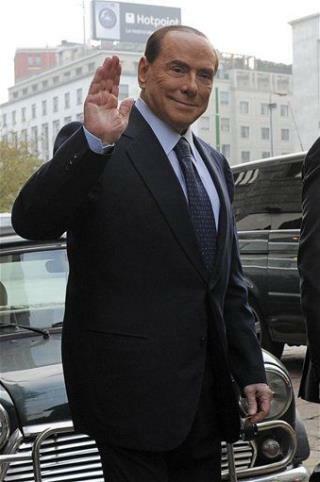 In Italy, cases must pass two levels of appeal before the verdicts are final, and Berlusconi is expected to appeal. The 76-year-old wasn't in the courtroom today for the verdict on the case stemming from dealings in his Mediaset business empire. im so fed up with this dipshit i'd wish I had a chance to choke him slowly with my bare hands. i'd love every second of it. today he ... retired his retirement from politics (announced the day before) in order to "fight the evil italian justice" or something like that. quousque tandem, berlusconi, abutere patientia nostra ? the good thing is, his crapper party is falling headlong under the daily (DAILY) huge scandals involving his men being found with millions of stolen public money in their pockets. this fucker silvio berlusconi is a one-man-gang. he's by himself a mafia syndicate and one of the biggest disgraces of italy in history. he is the Oskar Schindler of gangsters and thieves. A year. A year in is palace. He'll never walk into a prison. And to think that Romney is now tied to helping Berlusconi getting his sentence reduced! http://www.newser.com/story/1561223/romney-tied-Italian-Berlusconi-timebehind-reduced.html?utm_source=part&utm_medium=united&utm_campaign=rss_3_2 The republicons will have the story removed as soon as possible, no doubt!